The WAC insignia was widely used. 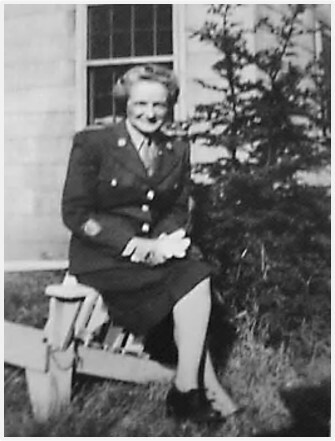 It would have even been on the buttons on Aunt Marian’s uniform. … hit upon the idea of a head of Pallas Athene, a Roman and Greek Goddess associated with an impressive variety of womanly virtues…She was the goddess of handicrafts, wise in industries of peace and arts of war, also the goddess of storms and battle, who led through victory to peace and prosperity. 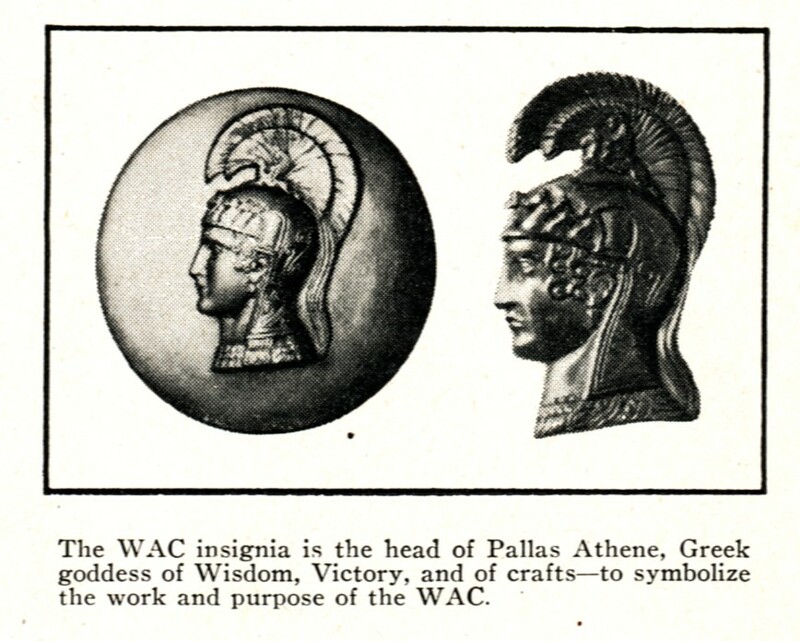 Accordingly, the head of Pallas Athene, together with the traditional US, was selected for lapel insignia, cut out for officers and on discs for enlisted women. Yes–she’s the goddess of handicrafts, and weaving in particular! One other thing I remember about Athena–don’t tick her off! I believe she had a wicked temper! I agree. . . Athena looks beautiful, yet very strong. A woman of opposites … Peace and battle …. Her association with craft wouldn’t be so surprising if you could hear me struggling with winding a new warp on my loom!!! If I’d heard mention of Athena, I would have thought immediately (and perhaps only) of war. I don’t remember the Pantheon very well, but I don’t think when we were studying Greece and Rome, I heard about the handicraft angle. Interesting. Heaven knows the serious crafters I know often battle with a variety of frustrations. It certainly is an apt insignia. Interesting, too. Peace and war is an interesting dichotomy. Your description of your sewing machine wonderfully describes how two opposites can be embodied in the same thing. Seems a very fitting symbol and my wasn’t she multi skilled! I also was surprised that she was goddess of so many things (many of which seemed unrelated to each other). I love that image! Strong, powerful! Yes! I never knew this was the insignia. Sheryl, I learn much when I visit your blog. What a goddess … peace, war, storms, battles … and handicrafts!